In a town neighboring Gilberton is The Strand, a building that used to be a theater and roller rink in the '20s. After a fire it closed for a long time, then it reopened in the '90s. It's comprised of three stories. The top floor, which was the original roller rink, is now a dance studio. That room also hosts remote control car races. There's a mini race track that loops around the floor. Leagues come from other parts of Pennsylvania and New Jersey to compete. There are two or three apartments in the front of the building. On the second floor there is a room that can be rented for meetings or birthday parties. In the corner of the room is a cluster of seats from the original theater. A velvet rope sets them apart from the rest of the room, and on the wall behind the seats are dozens of cut-outs of movie stars. An antique popcorn machine is nestled in between the posters and the seats. Lining the rest of the room are glass cases where John, the current owner, has his collectibles on display. Also in the cases are dismantled parking meters. Along with maintaining a paper route and running The Strand, John is a parking meter repair expert. The new ones are easy, he said, because all they require is a battery replacement. But the old ones were mechanical, which was more interesting. I thought so too, after seeing the gears on the display shelves. I first found out about The Strand through Mark, the man who sold me my property. He lived across the street from The Strand, and I often stopped by his garage to drop off payments. Mark had a background in fiberglass and formerly worked for the government. We were talking about bullet proof vests when I noticed a big pile of boards and ropes on the ground behind him. He explained the pile of stuff was a collapsed wrestling ring and that the building next door stored it in his garage. He told me they had matches there every month. I still have the ticket stub from the first one I attended. 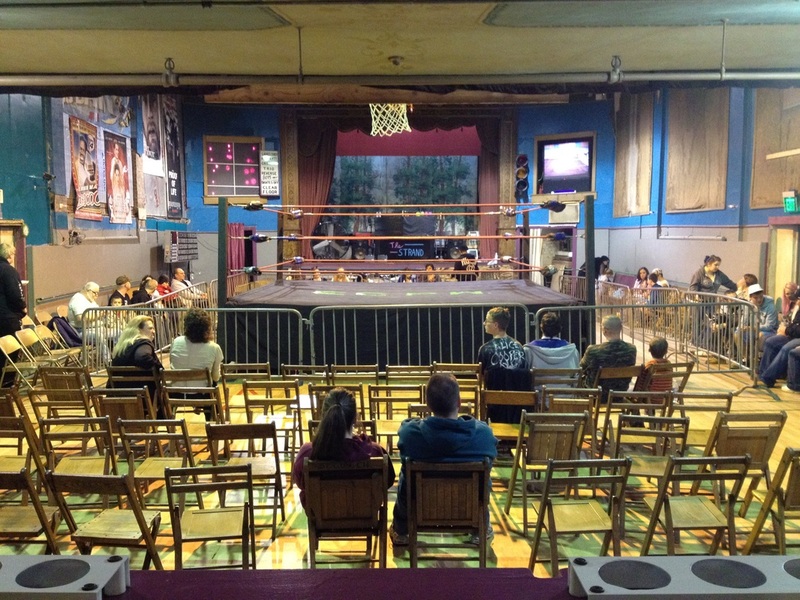 ​The first floor of The Strand, where the wrestling happens, used to be the movie theater. It is now also the roller rink, and it hosts other community events like Hawaiian dances and bake sales. Down the hall is a small arcade with a few quarter machines, and the last room on the first floor is available for birthday parties or meetings, similar to the room upstairs. This is the room I decided to rent because it had a kitchen. It was Sunday, February 1st, 2015. After greeting John I paid him the $15 to rent the room for an hour. Once the door was closed I changed into my white suit. Music from a skating party played through the wall. I unpacked my supplies, set the table, and cooked spaghetti and meatballs. I finished the meal with enough time to clean up and change back into my regular clothes.